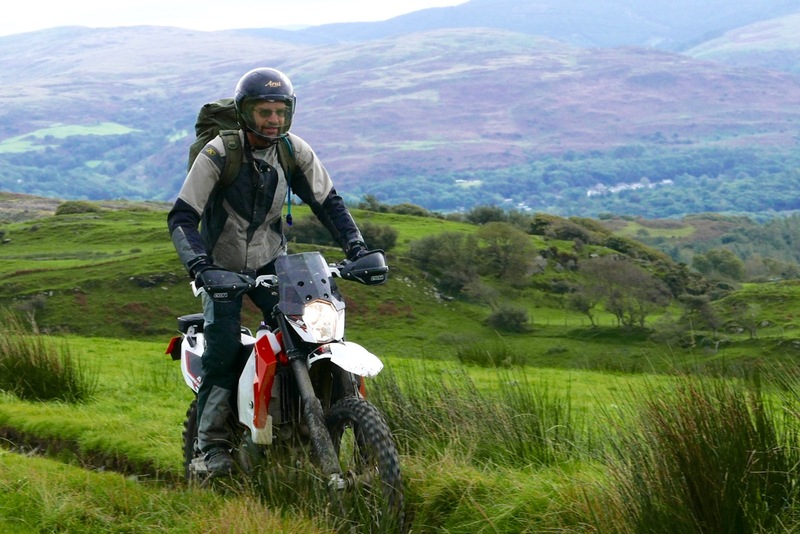 I haven’t been trail biking in Wales since my 20s. Makes me wonder what I’ve been doing all these years. Part of the reason is I’ve not had a bike worth riding up there, and then there’s the issue of untangling where you can ride legally. 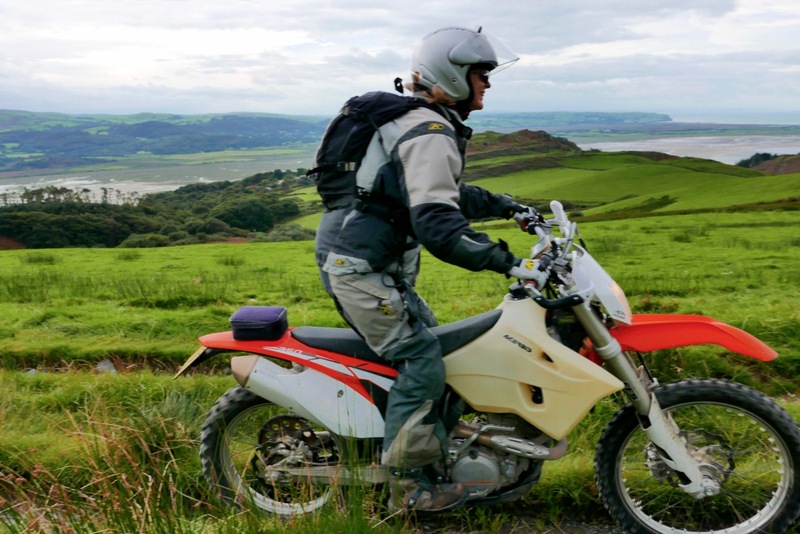 Desert biking can spoil you, but Wales gets a lot more inviting with a light and pokey WR250 and knowing the right people. 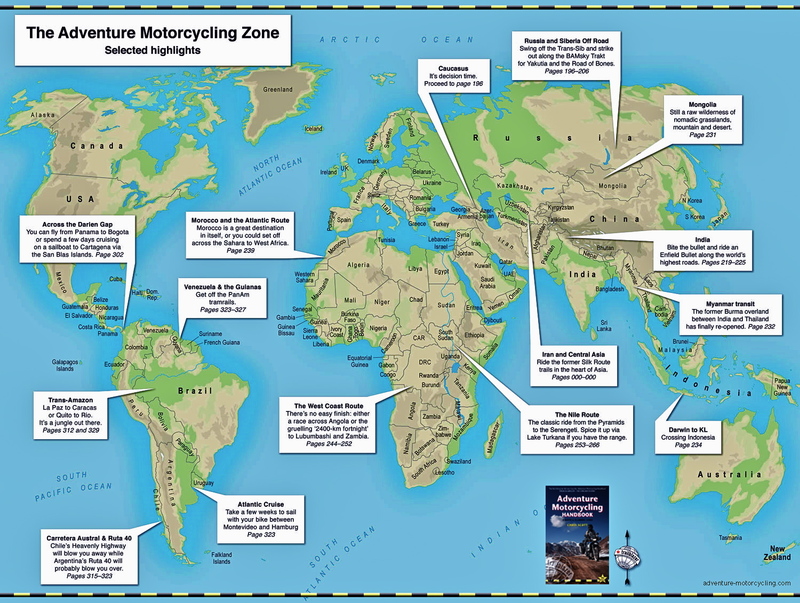 Dan and Dave were on my 2007 Algeria tour along with their own trips to all corners of the globe. 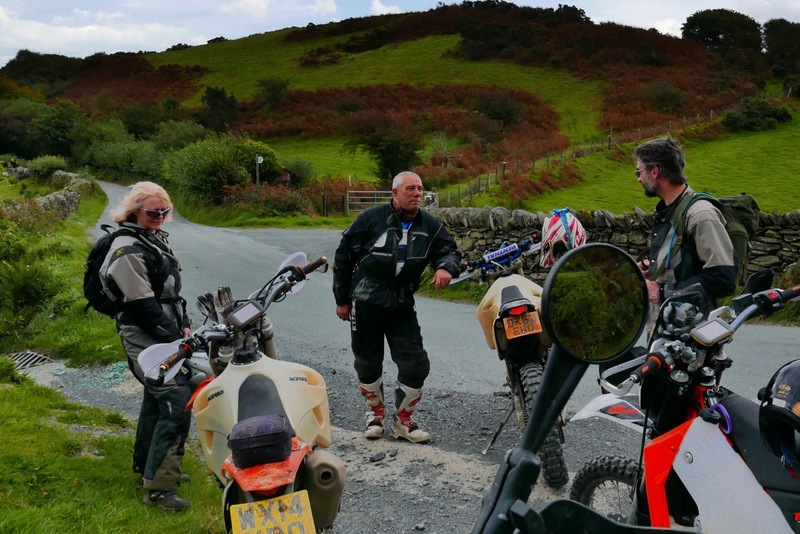 John, an old mate of theirs, works at the Yamaha Off Road Experience near Llanidloes, and generously offered to take us for a ride out. 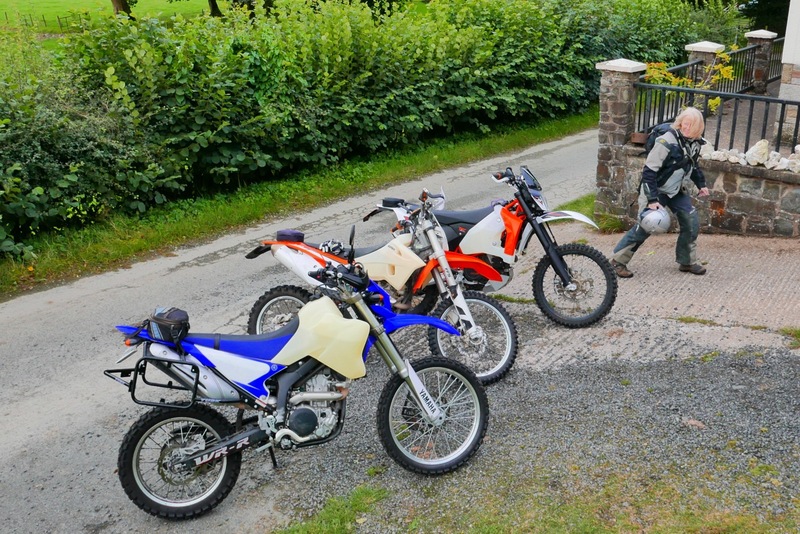 We vanned up to Llani, lubed up the bikes and rode over to Geraint Jones‘ hill farm where the Yam school is based. 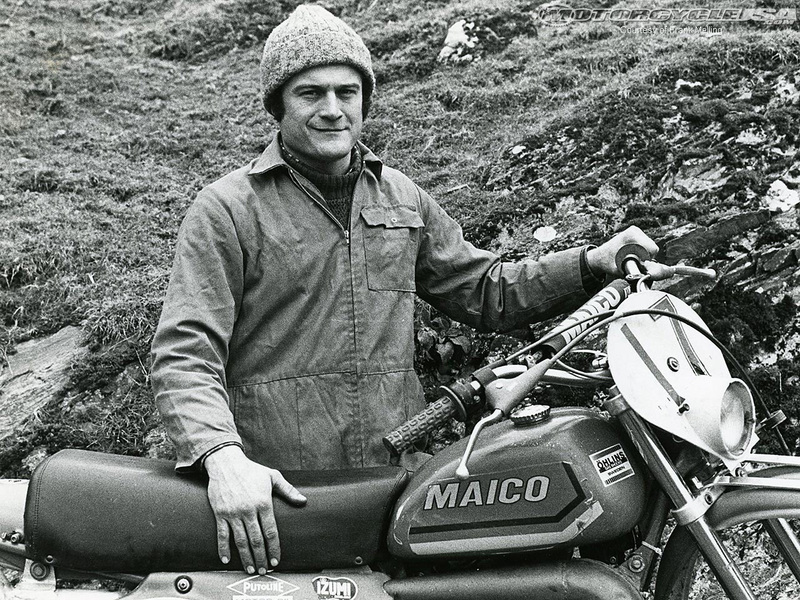 Back in the late ’70s when I was dirt-bike mad, I remember Geraint Jones (left, old pic) was ‘Mr Maico’. 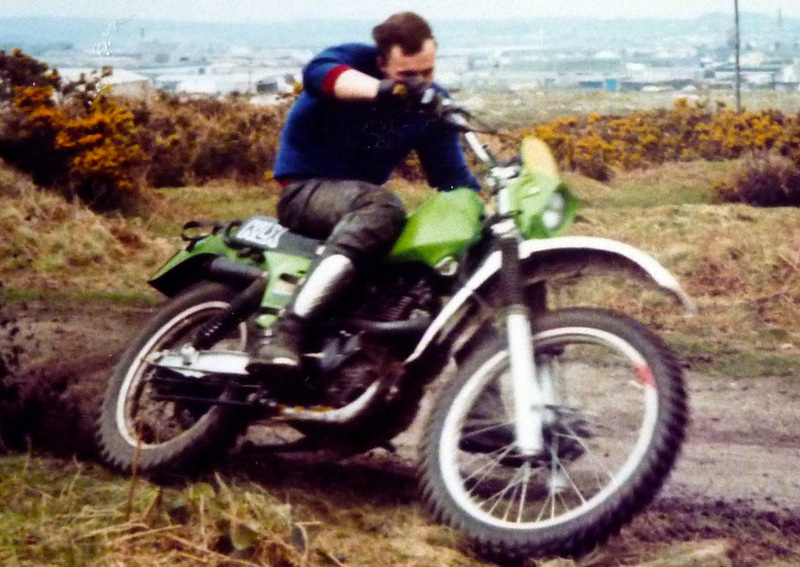 He was to enduros what Graham Noyce was to motocross, Barry Sheene to GPs and Martin Lampkin to trials. In amateur hands the big Maicos he rode had a reputation for being hard to handle. 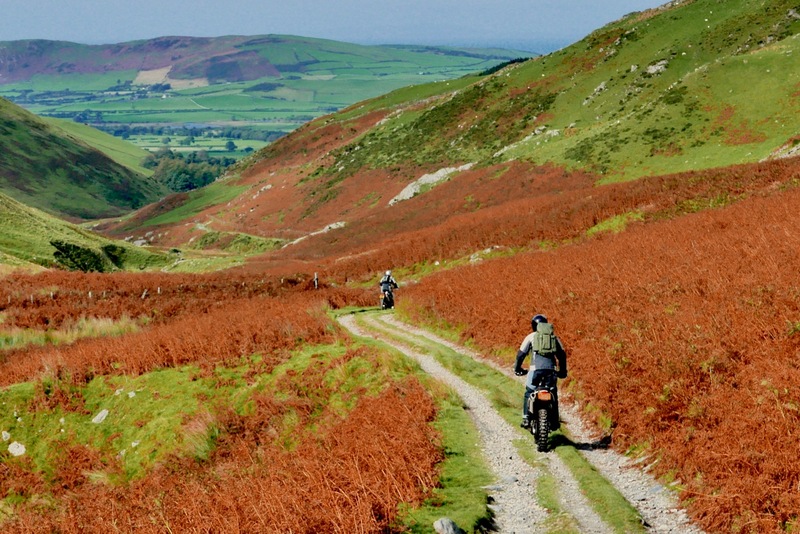 I remember the red devil machines flying overhead as I floundered about during the nearby Plynlimon Enduro in 1981 aboard a KLX250 (right) – the original sheep in wolf’s clothing. As I recall in SRY, I was so slow they were literally packing up as I rolled into the finish line. 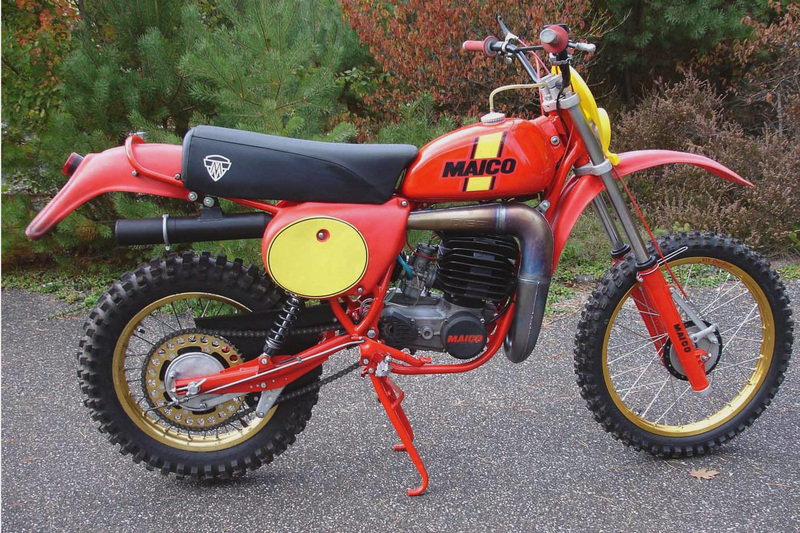 And if you ever wondered what happened to those red devil machines, this is an interesting read from our man, Rick Sieman. 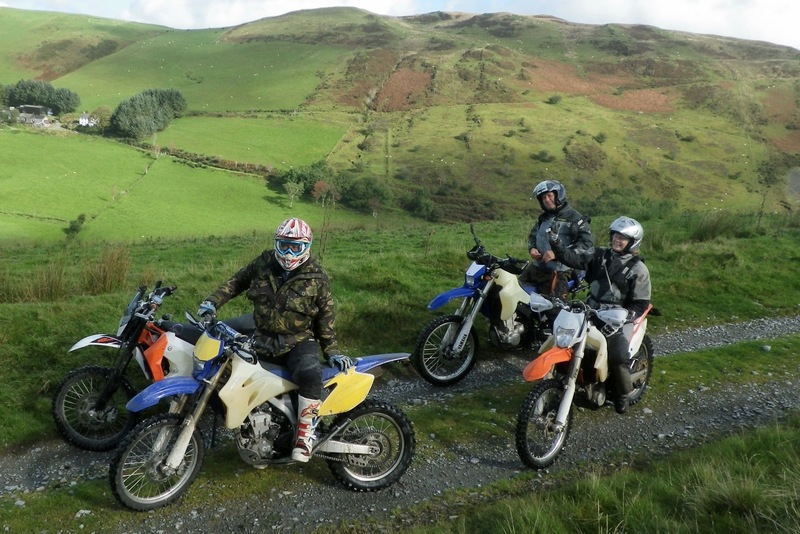 The benefit of riding with John from the school was that he knew the lanes, which ones would suit the day’s weather and the groups’ abilities, plus he had special access to Forestry trails in the adjacent Hafren Forest. 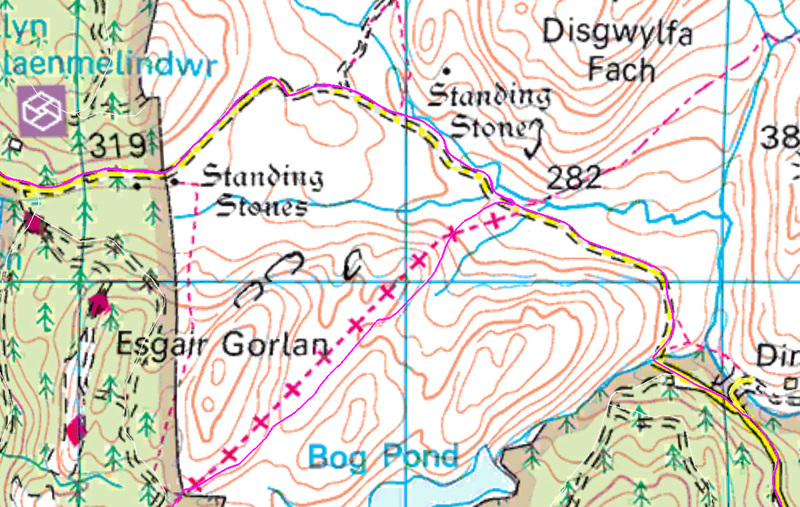 Hafren becomes ‘Severn’ in English, and a few minutes into the ride we passed within a mile of the River Severn’s boggy source on the side of Plynlimon mountain. 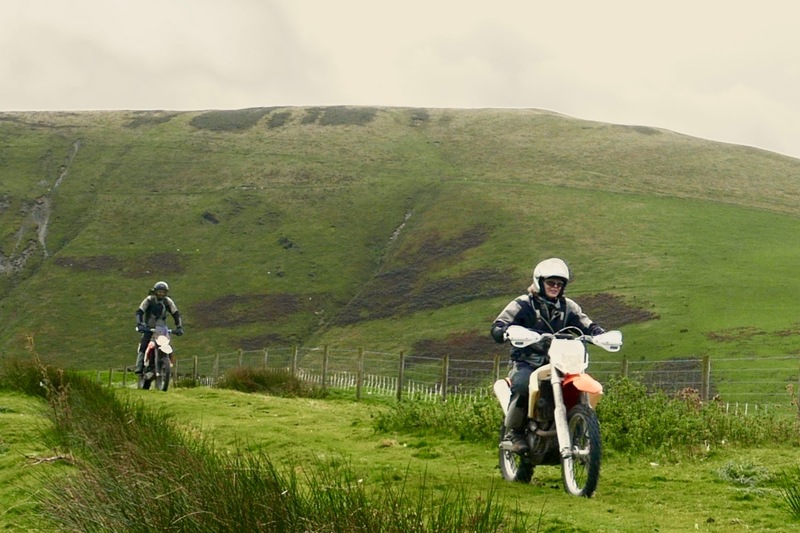 Dave was on his third and near-new 690, Dan was on a 100-kilo 350 EXC and John was riding a Yam WR250F, as used by the school. 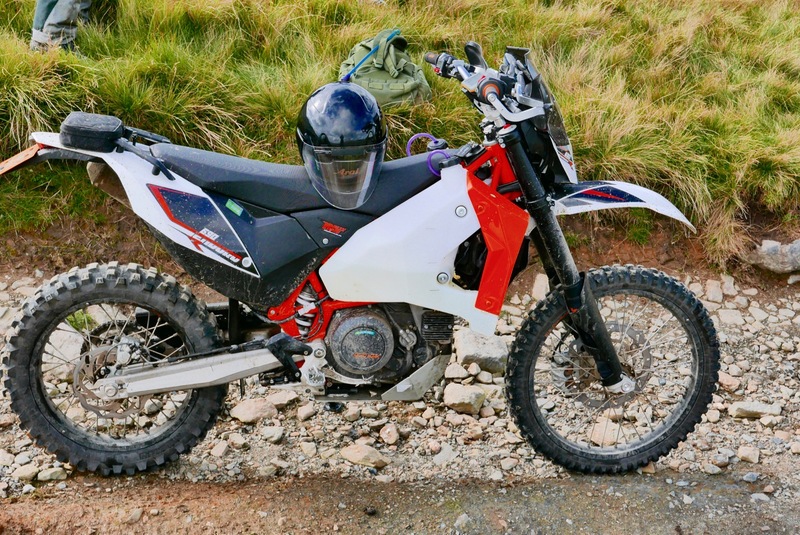 This is a full-on, super-light enduro machine and despite similarities is an entirely different bike from my heavier and less powerful 250R, below left. 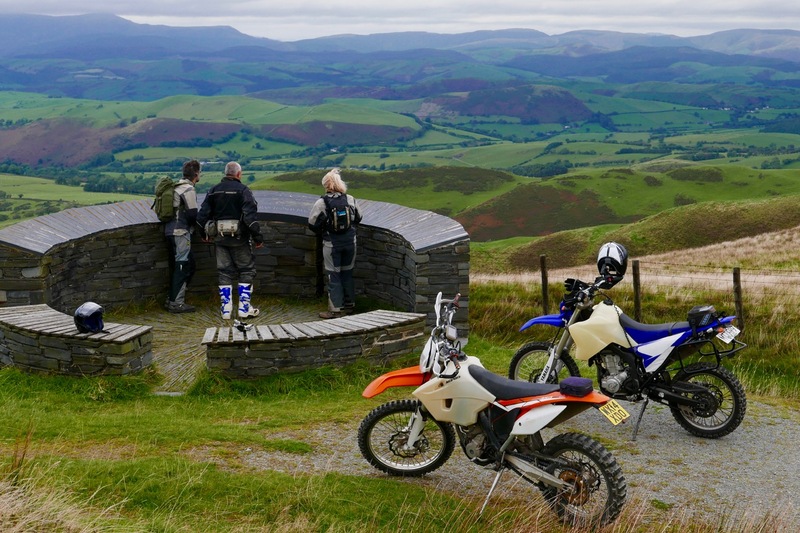 For me it was a real eye-opener how gorgeous the Cambrian mountain of northern mid-Wales could be. 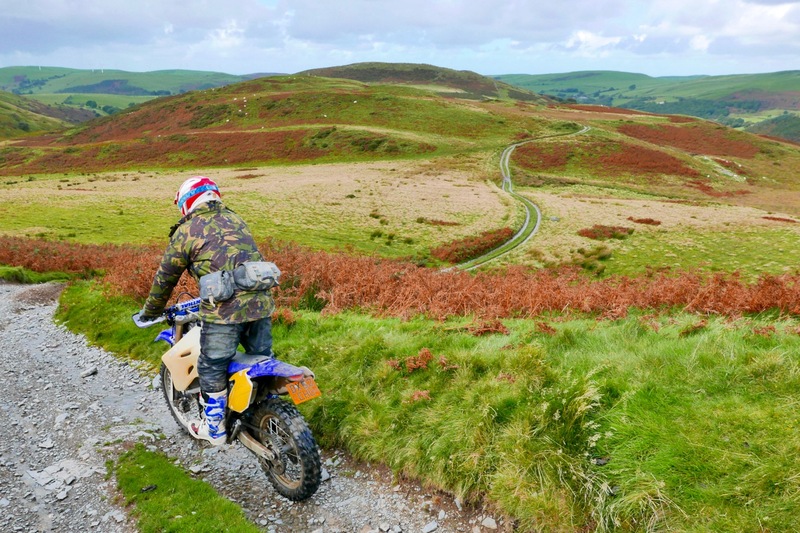 I’d always considered it a No-Mans’s Land between the better know Brecons and Snowdonia to the north which explained why green laning (using off-road vehicles on unsealed but public roads) was permitted to survive here. 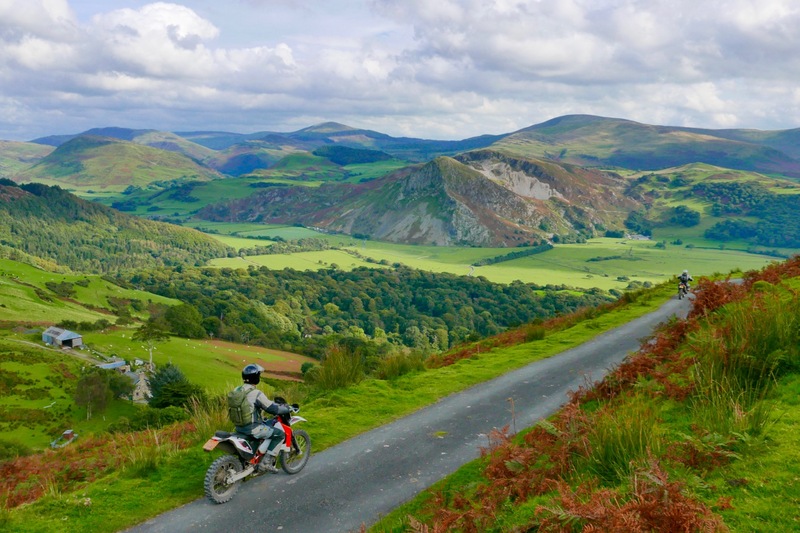 I can now see it as a great destination its own right – a compact Scottish Highlands but without the ir near-total ban on green laning, and without the rambling crowds of Snowdonia. 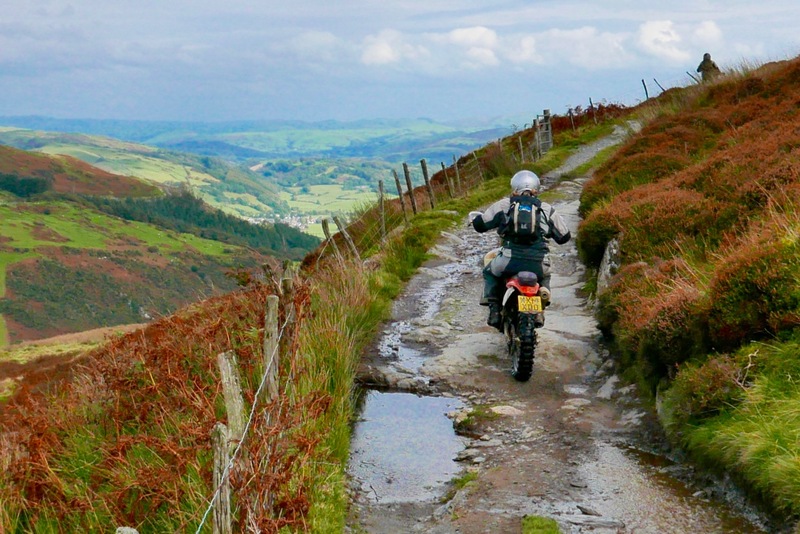 And never mind the trails, much of the fun to me was cruising the deserted single-track backroads that snaked across the moors – the yellow C roads on the map you could do on any bike. 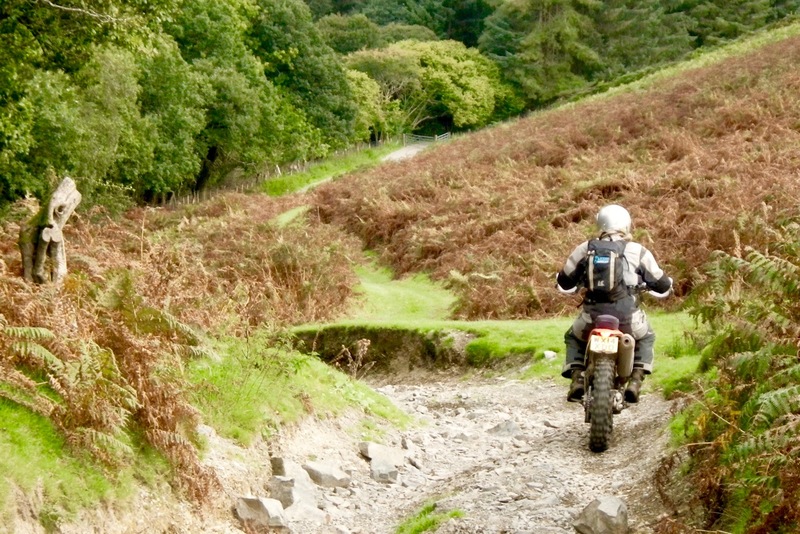 After Machynlleth, heading up the gnarly ‘Happy Valley’ green lane reminded me my WR was still without a proper bashplate (the OE one is seized on). In the meantime I was amazed how well the unfashionable Bridgestone TW301/302s tyres were managing. These came with the bike in 2008, were refitted by Hyperpro on selling it, and I can say did not miss a beat. My snazzy Hyperpro suspension soaked up the easy pace too, just as you’d expect, though I dare say I could have refined it by playing with the knobs. 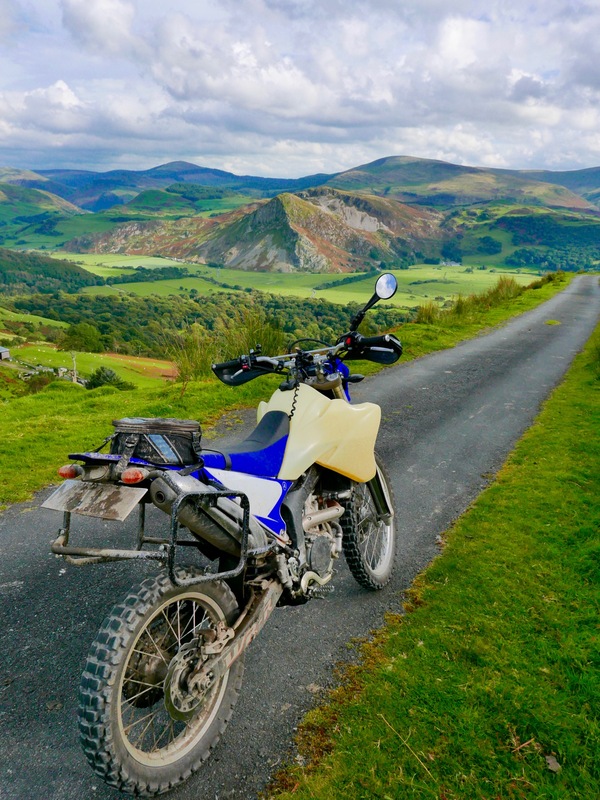 Like the TTR250 I used in Spain in the summer, I never wished for more power on the trails or backroads – but then we did cheat by vanning the 200 miles up from London. 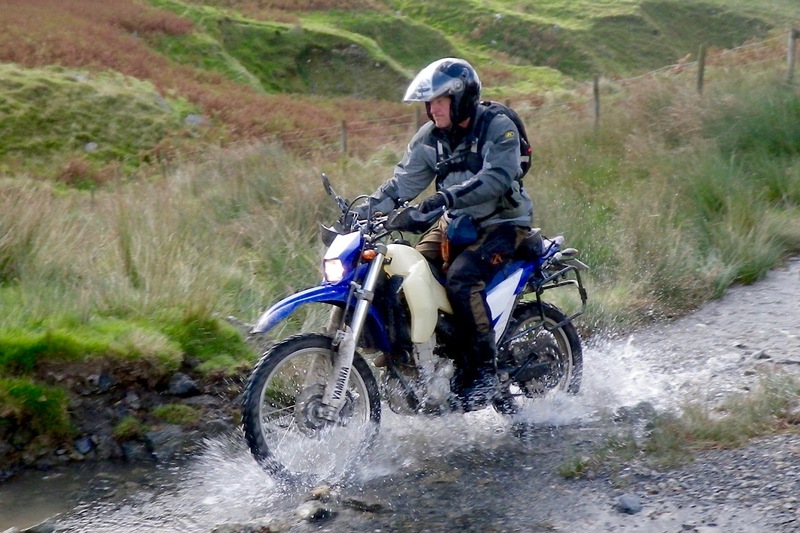 The good thing with modest power is the tyre won’t spin out readily, but if caught in the wrong gear that WR still had enough to chug its way out – I never stalled it. After reading so much about them, Dave let me have a quick spin on his 690 (recently fitted with Evo 2 aux. tanks) but can’t say I’m a convert yet. The KTM’s thumping vibration really struck me, soon followed by realising how quickly the sharp brakes and more than double the WR’s power could turn on me if tired or not concentrating. But the bike had a solid feel that even a new WR might not match, and out in the open desert I bet it would be in its element. 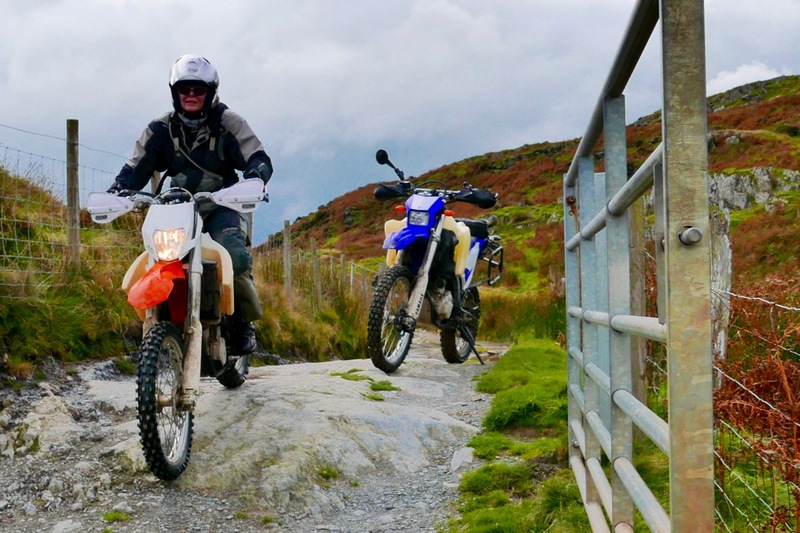 A quick spin on Dan’s 350 EXC (right) on soft power setting was much more like it, but that bike needs new oil every 1000 miles so isn’t a contender as a travel bike. 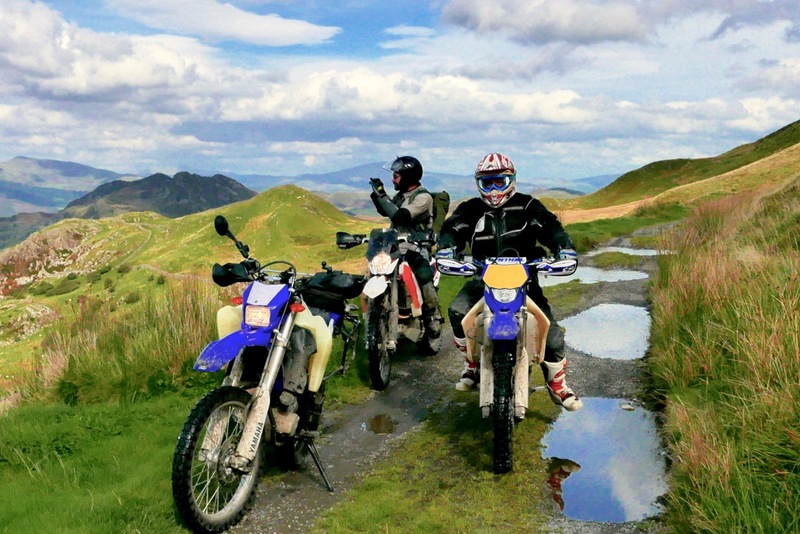 What I’d like is a 450 version of the 690, but pitched as a less tyre-shredding travel bike. Press the red button if I’ve said this before. 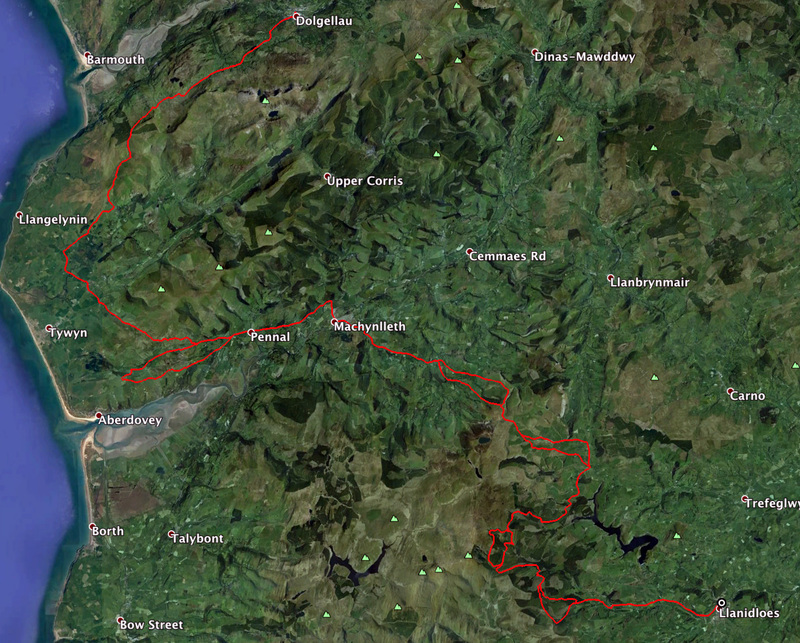 There sure are a lot of gates on the green lanes of the Cambrian mountains. 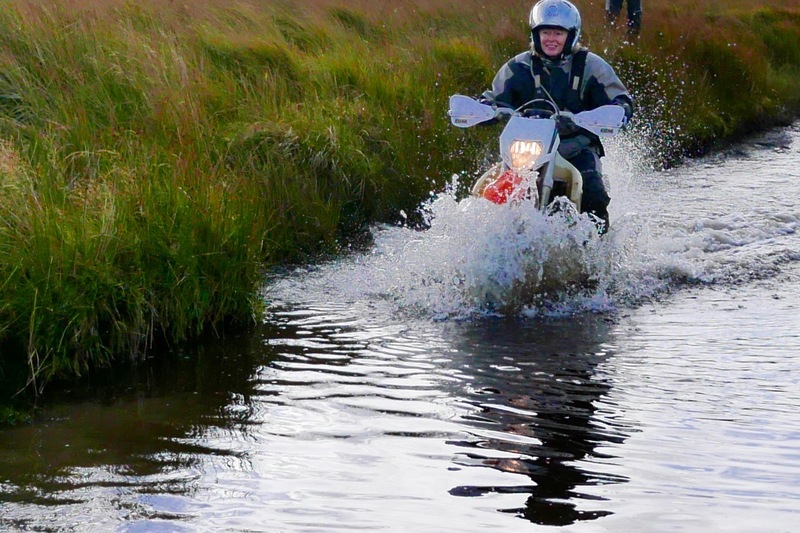 It was rare to ride more than five minutes without doing the gate dance – and sometimes less than a minute. 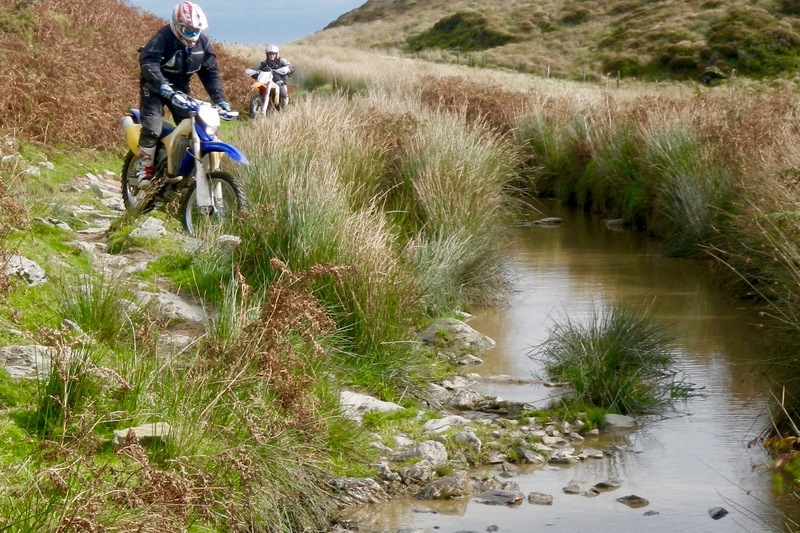 It breaks the rhythm of the ride but they contain the sheep which can easily jump a cattle grid if spooked. 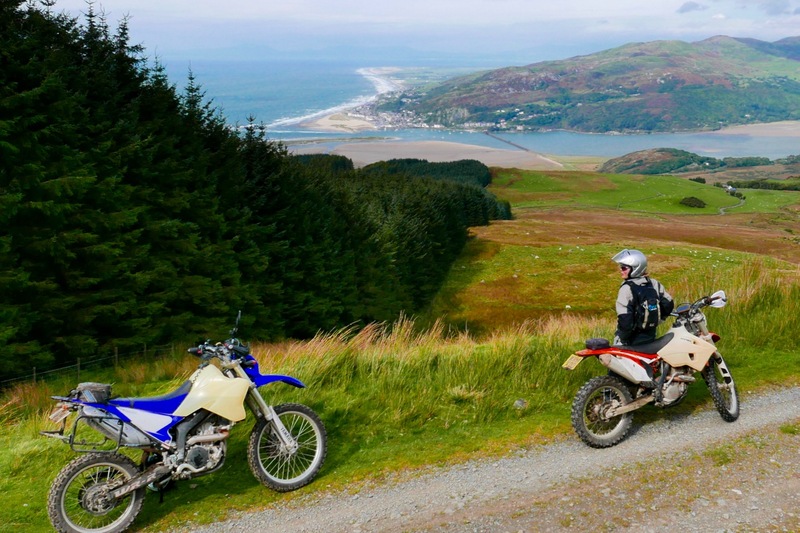 The trail north into Dolgellau between Cader Idris and the Barmouth estuary was a notable exception – a good ten minutes riding or more between gates. We came across a few ramblers and dog walkers who didn’t look too put out – they’re walking along a ‘road’ after all, even if they don’t realise it. 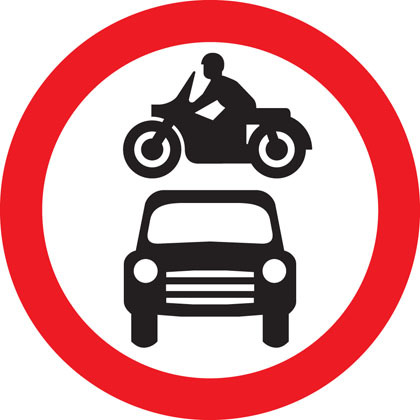 And we nearly ran into a big group of lads bursting out of the forest on unlicensed dirt bikes. Damage wise, their impact was minimal and who knows, the new Geraint Jones could be among them, but I bet they’d all rather be legit. 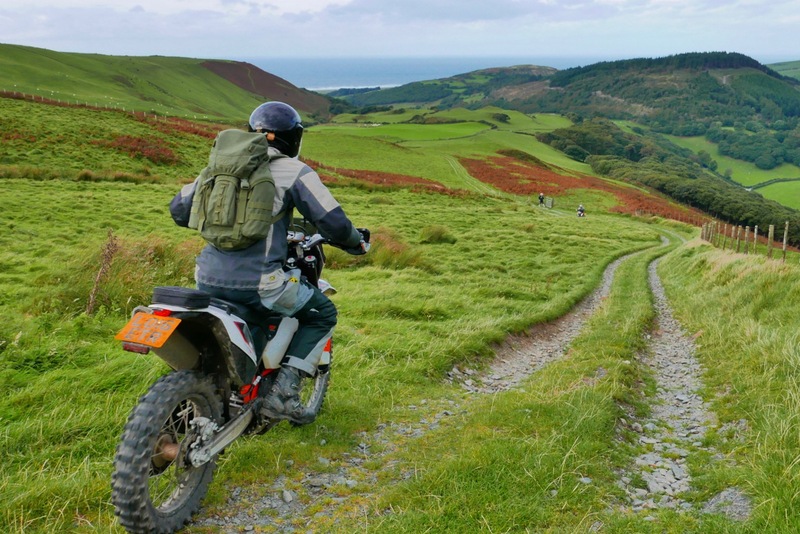 Wouldn’t be it be great to have a huge trail park out here where people could roll up and ride round at their own pace, instead of the scurrying around on wasteland or dodging the rangers. It poured overnight but day two actually dawned even brighter, apart from a well-timed downpour as we ate lunch in Talybont. 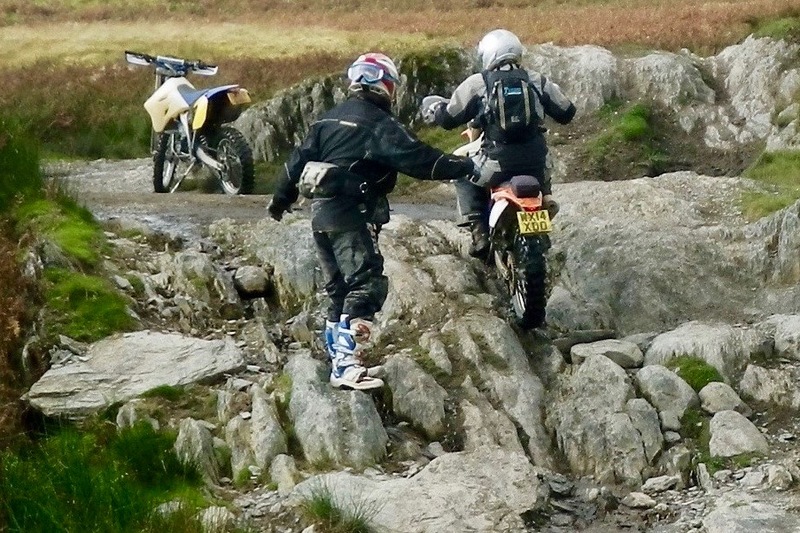 Either the riding was easier or I was getting to grips with the WR. On rougher trails I did find it hard to ride smoothly; balancing the jerkiness of the engine with the right gear and the rebounding suspension while looking at what’s coming up and steering away from rocks, but this is just the nature riding a light, small-capacity bike at slow speeds. Turn up the wick if there’s room and things would smooth out. After the rain there were some bigger puddles today too. Initially they were a worry as I’d read the WR was prone to cutting out in a splash, but even with the engine note muted in two feet of water, it never even coughed. I don’t know if it’s been a dry spell – in Wales, what are the chances? 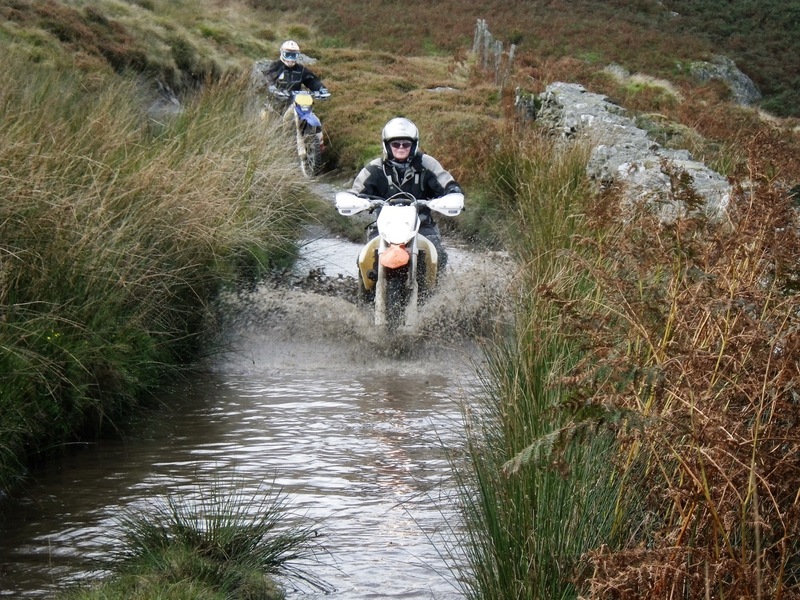 – but the ride John led us on was pleasingly free of mud and to me was all the better for it. 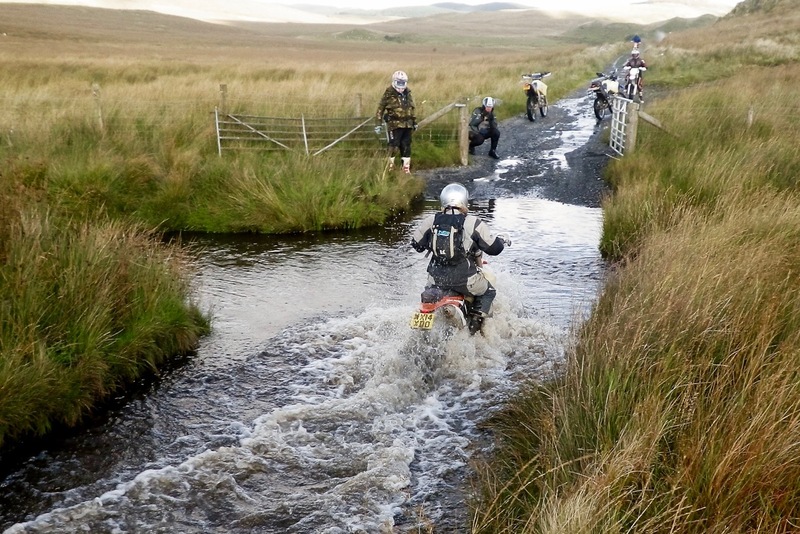 My recollection of bombing around Rhayader on XTs 30 years ago was plunging into one peaty morass after another which just makes a mess of you and the landscape. 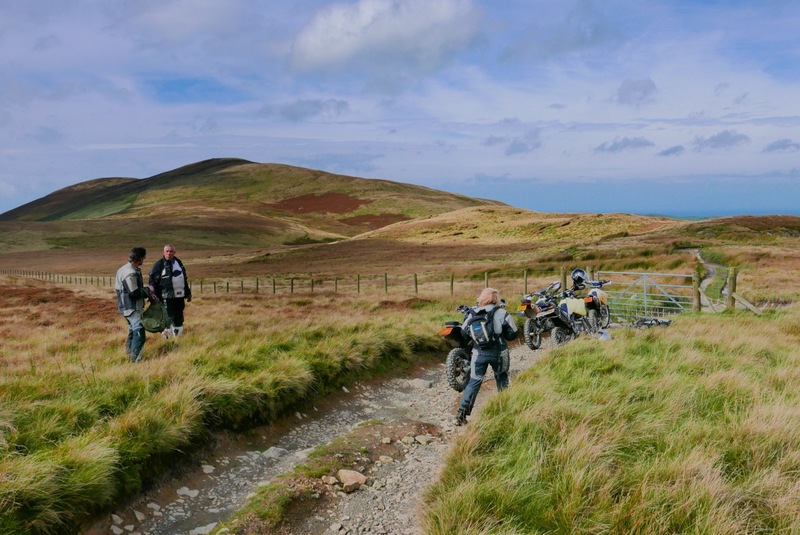 It would be great to do more riding around here on my own, as it’s as wild and extensive as you’ll get in the UK (there’s virtually no green laning in Scotland). But unless you live nearby or do the research, it would be hard to get a handle on which trails are legal and then put together a satisfying two-day route like the one we followed with John. 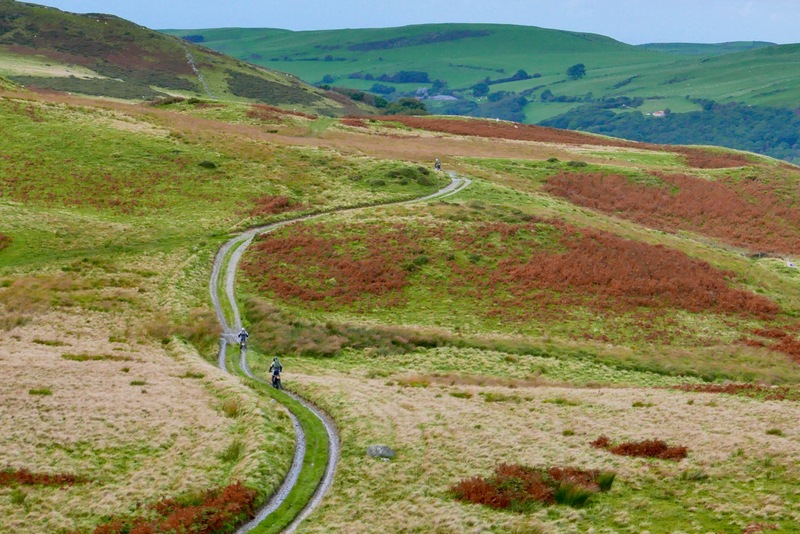 Every year more and more green lanes in England and Wales get downgraded to paths. I haven’t a clue which of the trails we did were open to all, but promisingly I only saw one ‘no vehicles’ sign. 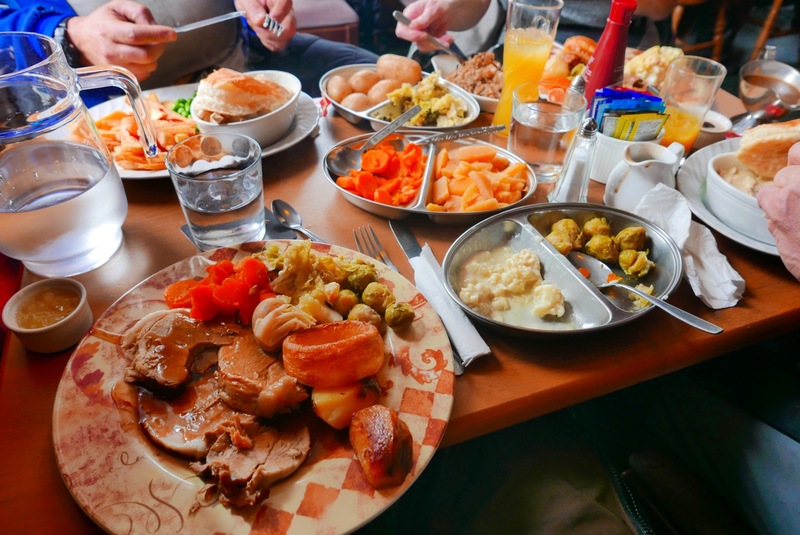 Lacking a local pro like John, the answer is to hook up with the TRF or join an escorted tour from £50 a day with four of you. That’s just the way it is living in a small, crowded country and why I set off for the wide open Sahara in the first place – and why I’m off to Utah next week! 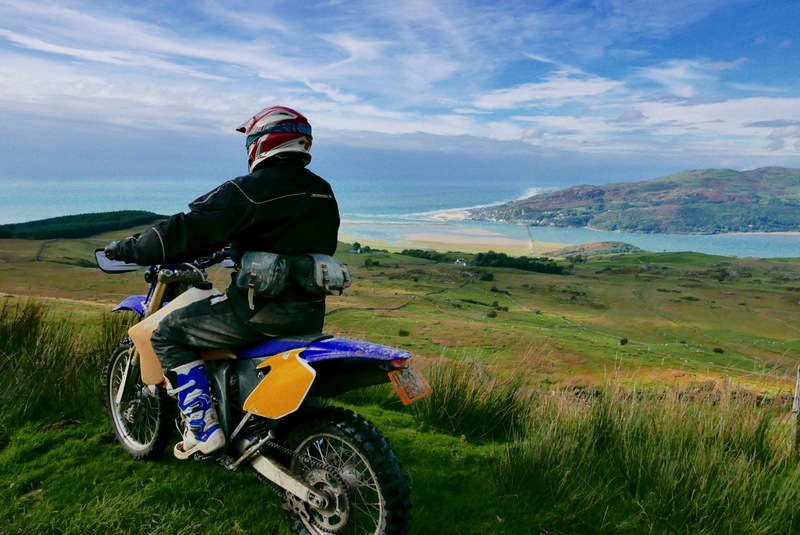 This entry was posted in AMH News, Tyres, WR250R and tagged KTM 690, maico, trail riding wales, WR250R. Bookmark the permalink.